Sultan Mohmmad Begado, at that time, ruled Gujarat. He ascended the throne at the age of thirteen and began annexing one state after another to the state of Gujarat. He indulged in forced conversions of the defeated populace. Those who refused to convert to Islam were ruthlessly killed. He invaded Junagadh three times during 1467 to 1469 CE and defeated Ra Mandlik, the king of Junagadh and forced him to embrace Islam. During 1483-84, he invaded Pavagadh and defeated Jaysinh Raval, the ruler of Pavagadh. After Junagadh and Pavagadh, he set his eye on Shatrunjaya Tirth. The victorious Begado was now arrogance incarnate. He had nursed an ambition to conquer Shatrunjaya Tirth and wanted to flatten it completely. He invaded it with a huge army and the carnage began. He had thought it would be a cakewalk for him and he would conquer Shatrunjaya and demolish the temples in a jiffy. Who would protect Shatrunjaya against the marauding army of Begado? About a hundred Barots (name of a caste) risked their lives to protect Shatrunjaya Tirth and sacrificed their lives fighting the infidels. Shri Shatrunjaya Tirth is rightly considered the chief among all the centres of pilgrimage. The first Tirthankar of Jain religion, Bhagwan Rishabhdev, had sent out the message of non violence to the world from here. Moreover, the mountain has been sanctified by twenty three Tirthankars. It is difficult to find anywhere in the world such beautifully-carved idols and temples in such a large number as are found here. 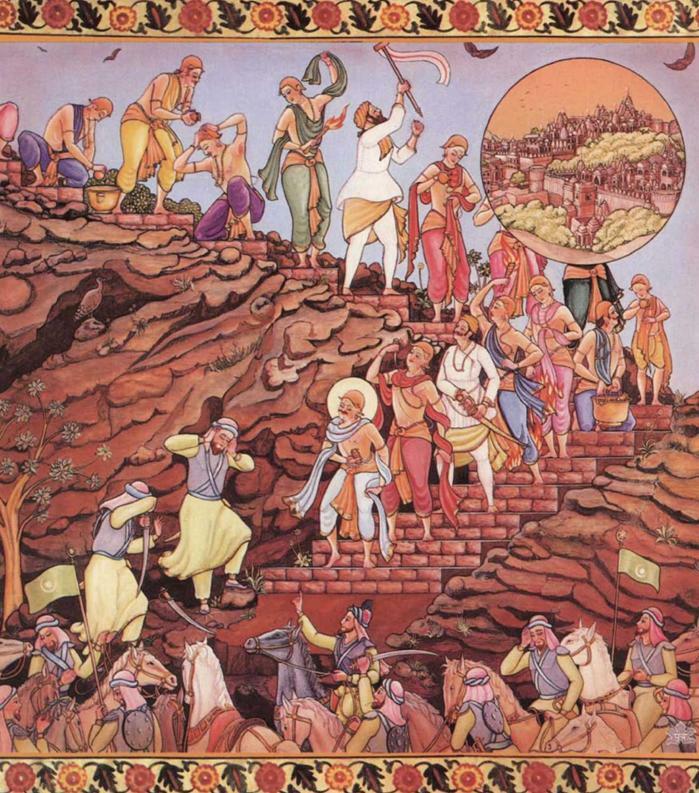 The tirth (centre of pilgrimage) was not founded by any king, nor was it constructed with the help provided by any king or by hiring the labourers to work for it. It is a symbol of the religious sentiment of the people which resulted in its creation and hence its importance. Such a unique place was threatened with external aggression and the very foundation of religion was challenged. Mohmmad Begado laughed mockingly and said: “You are mere hundred and my army is vast - how dare you challenge me? You are all unarmed and have the cheek to challenge me? Don’t cross our path or else you will be crushed to death.” Kabhai was undeterred. He refused to budge an inch and said: “Sultan! Retreat at once. If you fight, we will shed our blood and you will have to walk over hundred corpses.” The Sultan Begado ordered his army to march. Suddenly Kabhai unsheathed his dagger and thrust it into his chest. His lifeless bod.y fell on the ground. Everyone let out a painful cry. The other Barots too followed suit and each one sacrificed his life. The sight of each dying was so gruesome that Sultan Mohmmad Begado was moved. The army stood motionless and everyone felt shocked and stunned. Then Begado came forward and said: “0 Barots! Today I stand defeated. My powerful army has been rendered powerless. Mohmmad Begado has seen valour on the battle field but never has he seen an act of sacrifice of such a magnitude.” Ashamed, he returned without conquering Shatrunjaya Tirth.